Take a tour through southern Germany on Castle Road to see over 70 of the world’s most magnificent castles. If you’re thinking about trekking through Germany this summer to do a little castle-hopping, the best way to do so is to head to Castle Road where you’ll be able to check out some of the most beautiful and architecturally masterful structures in the world, all along one road and in the span of about a week. Established in the early fifties, the roughly 1,000-kilometer long Castle Road winds its way through southern Germany from Manheim and into the Czech Republic, finally ending in Prague. On this route you’ll see some of the world’s most breathtaking countryside, brilliant fortresses and even a few medieval villages that are so well preserved that they’ll sweep you back to a time long since past. You really need the whole week to hop down the line to each uniquely enchanting fortress. There are around seventy castles to cover, so if you try to make it to about 10 a day you should see them all. Thirty Years War, it was used by locals as shelter when the need arose. The property was ceded to the King of Prussia in 1792 and surrendered to Napoleon in 1806. Napoleon ordered the castle destroyed during that same year (it was obviously not razed since it’s still there today). During the 1930’s Adolph Hitler housed his highway department in the old castle, and it was there that the main highway connecting Berlin and Munich was built. The castle is located atop a steep hill, overlooking the picturesque village below. It has a central courtyard, surrounded by towering walls and well-kept gardens. 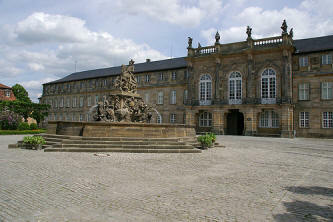 For those who enjoy history, beauty and music, there’s nowhere better to visit than historic Bayreuth. The old castle was first mentioned in 1194 and stood on a hill above the small village of Bayreuth. During the next few centuries it was the victim of fires, plagues and wars, only to be rebuilt each successive time. 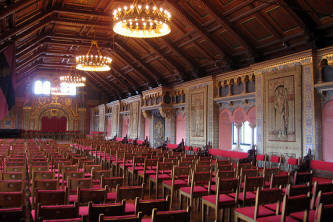 During World War II, it was used as a concentration camp and suffered heavy damage from bombings at the end of the War. Composer Richard Wagner moved to Bayreuth in 1872 and stayed there until his death in 1883. An opera house was constructed near the castle as a tribute to Wagner and it’s been delighting sold-out crowds since it’s opening in 1876. Amazingly, the waiting list for tickets can be up to ten years. Another notable German, Friedrich Nietzsche, was still an unknown philosopher when he first visited Bayreuth during his younger years and the castle later served as a focal point in his works. The grounds are beautifully kept and the pink and white stonework with blue roofing stands today as a grand example of the old German castles. Built in 1067 by King Ludwig the Second, Wartburg Castle stands among the majestic Alps in all the grandeur of a fairytale realm brought to life. The spires and pinnacles and towers lift high into the heavens. Frescoesadorn the castle walls: tributes to the many musicians who once competed for prizes in the castle halls. They really do add an air of mystery to those who see them. During the Protestant Reformation, Martin Luther was sent there as a prisoner as punishment for his ideas. It was here that he worked on his translation of the Bible into German and his desk and original Bible are on display, including the actual notes he made in the margins of the Bible. 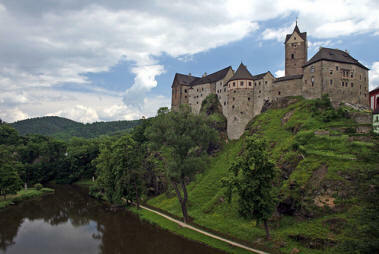 Since Wartburg was placed on the World heritage list in 1999, the castle’s popularity has only grown and is now one of the most frequented castles of them all. Be Sure Not To Miss . . . 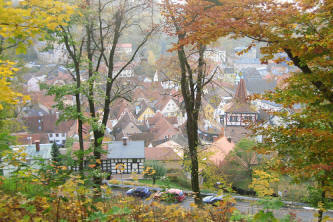 This is, of course, a very traditional area of Germany, and some of the country’s best beer is brewed and served here. So when you find yourself at the end of the road, make sure to relax by tilting back a few steins of beer while reminiscing about your journey visiting some of the most majestic structures ever created by man.